Behind the scenes Zane Williams may be St. Louis’ biggest sports fan. The company has been the choice printer for the St. Louis Cardinals and St. Louis Blues for over 15 years. The large format printing company prints the teams’ light pole banners, exterior promotional banners and other custom print projects for special events and TV commercials. Zane is already anticipating work for “Red October” the post season for the Cardinals, as well as the Blues season opener in September. Working with such big names in the industry means perfection on every print job. Zane doesn’t only offer the best product out there, but also turns around these sports banners on a dime to meet deadlines even when the artwork comes in the day its due. In addition to providing graphics throughout the regular season, Zane Williams handles special events for the teams. 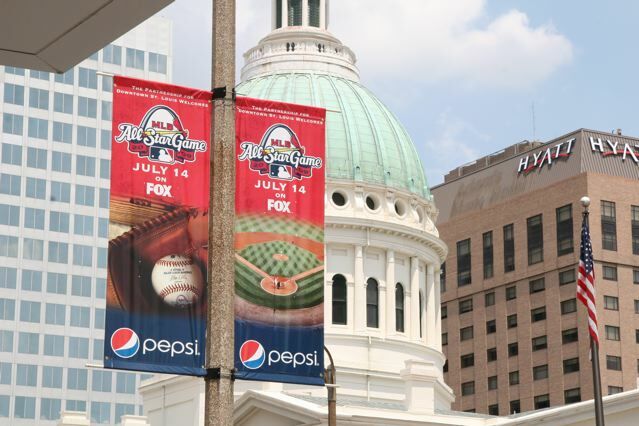 This included the 2009 All Star Game that was hosted in St. Louis where Zane printed hundreds of promotional signage, light pole banners and wraps to transform downtown St. Louis into Cardinal Nation. “It’s truly an honor to be apart of such awesome St. Louis traditions. I know that excited feeling when I’m with my kids and we start to see the Blues banners on our way to Scott Trade is something that I will never forget as a parent and diehard Blues fan. The work that we do for the Cardinals and the Blues is one of the things that makes Zane one of the best printers around,” said Jeff Williams. These sports teams are not the only St. Louis organizations that have chosen Zane time and time again for large banners and printing projects. Zane has also worked with St. Louis organizations such as the Magic House, the Saint Louis Zoo and Community Financial to name a few. Zane Williams is a full service, large format print shop that prints anything that lays flat. The company’s work for the St. Louis Cardinals and the St. Louis Blues can be found on their website galleries at http://www.zanewilliams.com/gallery.html. Zane Williams is a 55 year old, family owned digital printing and retail signage supplier located in St. Louis, MO. The printing company has won many national and international awards for printing excellence, specializing in all types of banners, decals, soft signage, window decals, posters and POP. The St. Louis Business Journal has listed the company as one of the largest printing companies in 2014 and 2015. Zane Williams has partnered with REXframe™ to bring the very latest in tension fabric displays and back lit fabric. Other services include, die-cutting, warehousing, fulfillment, shipping and tracking. More information can be found about the printing company and its services on their website at http://www.zanewilliams.com or by calling (314) 547-0787.